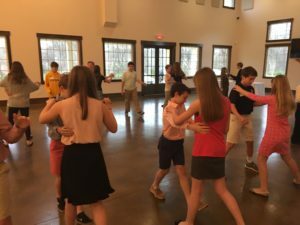 Impressions: The Modern Cotillion - Finesse Worldwide, Inc.
On February 25, 2018, we had our first Impressions: The Modern Cotillion session of the 2018 winter Impressions class. During the class, they learned the seven key things they need to do to make a good first and lasting impression on others. We did group activities and had the kids work on this a lot, so hopefully, they can tell you about all seven which are to have good: Attitude, energy, eye contact, posture, smile, listening skills, and hand shake. Then, we did a game I call “Conversation Catch”. This game was to teach them the importance of being able to carry on a conversation with another child or with an adult, and how easy it really is to do. Lastly, Impressions: The Modern Cotillion taught our enthusiastic kids how to Waltz! While I believe they all learned the steps, what was the hardest thing for them was to actually touch the person of the opposite gender! Wow, if you could have seen their faces!! I know this is hard, and many of them were mortified (hiding under the tables and in the bathroom), but it’s actually a very good step for them to take at this age. 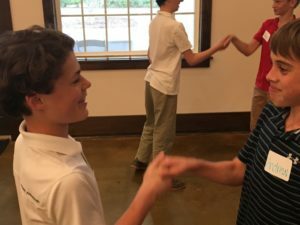 Over the next Impressions: The Modern Cotillion classes, this will get easier, and you never know, they might even find that they like dancing!